A top priority for an Amazon seller is making sure they reach their product’s full listing potential. All of the Amazon’s top sellers have had to learn this at some time or another. There are some cases where people have managed to increase their sales in upwards of 25%, just by making what seems a minuscule change to their listing. The product title has an enormous impact. It is intangibly important when it comes to making an impression on a customer. It is also extremely important when considering rank with Amazon’s A9 algorithm. Let’s first take a look at the Amazon seller’s guidelines for product detail pages. They are a bit lengthy and you can study them in more detail here. In short, things like obscene content, soliciting reviews, and external links (especially links to your online store or any other purchasing option, can’t be included in the listing. )Phrasing that Amazon calls “marketing speech” are also prohibited. You cannot use phrases like “NEW,” “SPECIAL DEAL,” or “LIMITED OFFER,” etc… The Amazon seller guidelines are rules for your entire listing, not just your product title. In the case that you break any of these rules, you might get sanctioned by Amazon. This can be anything from simply informing you to change an aspect of your listing to suspending your listing, to even terminating your account. IT would seem that having a title of over 80 characters doesn’t really affect your listing in any way. It would also seem that some extremely successful products seem to be getting away with making Titles longer than the Amazon seller’s guidelines suggest. We recommend that you follow these guidelines. People not only break the rules on the product title length, but on other parts of the listing as well, especially on bulletins. You shouldn’t be afraid to use all your 200 characters if you need them, but remember, if you are going over, it’s at your own risk. Since it makes the most sense that your product title will be the most important in terms for ranking keywords, take advantage of that. You must be certain that your product title makes sense, but your primary focus must be own choosing keywords that will help the products rank. When you think about it, product titles are not exactly coherent sentences. The purpose of them is to relay information like “what is this,” “what it does,” and “what can I use it for.” Seeing things like “black,” “wireless,” “waterproof,” or “for hiking” etc.. is very common, and no one’s seeming to mind. you should not be overly concerned about how aesthetically pleasing your product title is, just make sure it contains the most important information. That’s what good keywords are; important information that people search for. Now that you know how important keywords are, you should find a way of getting some good ones for your product title. Those keywords are most likely going to be things that draw attention to some special features, colors (multiple color options if you have a variation listing), materials, intended use etc… How to find the right keywords? Here you should be focusing on 2 things, the search volume and the relevance to your product. You want to include keywords with a large search volume. You also don’t want to put keywords that don’t describe your product well. You can also be on the lookout for keywords that cannot be used to describe your product. 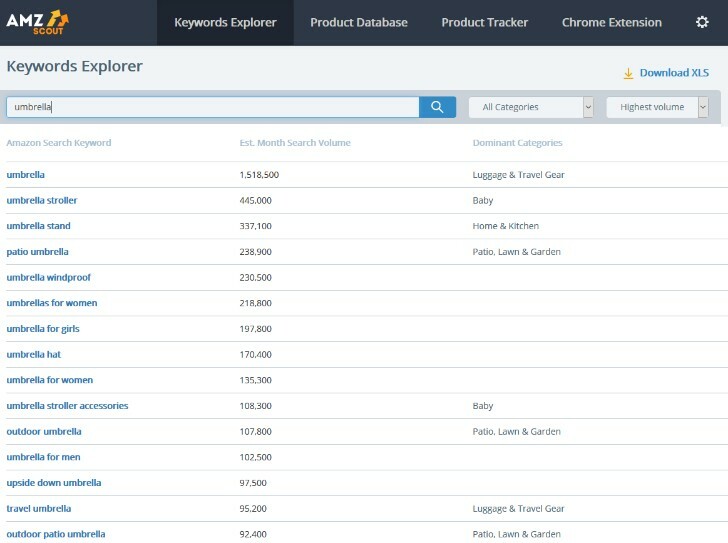 You can use other keywords in your backend so that your product will have a chance to show up for people that are looking for things that are similar to your product. They might consider yours a good substitute. For example, if you are selling a plain green umbrella, you might want to include the keyword “green dots umbrella” so that it might show up for someone looking for one. They might be interested in yours. In this case, you don’t have a green dotted umbrella, but you want to show your product to people looking for it. Since it cannot be used to describe your product, you put in into the backend rather than in your title. - Take a look at your competitor’s product title – Since keeping an eye on keywords is something that is considered constant duty of any top amazon seller, you should see what your successful competitors are doing. It would not be a bad idea to try and get a search volume of each and every keyword you can find in a successful competitor’s listing. It would also be wise to do a standard organic search for some of the keywords they use just to see how well positioned they are on Amazon. This way, you can see how much a certain keyword in their title has paid off for them. You should (delete:all) keep an eye out for any PPC ads your competitor is running on those organic searches. That way you can have a better idea of their overall strategy. Having a keyword in your title also increase the probability that your ad for that keyword will show up more frequently and get more impressions. If you are just starting an Amazon business, a private label business to be precise, make sure you include your brand name. At first this will not have an impact on your listing optimization in terms of search, however, it is a necessary thing to do. Your brand name needs to be very obvious since its primary purpose is to be remembered by your customer. You can do this by putting it as the very first word of your product title, or by putting it at the very end like: “by [insert brand name]”. This is extremely important because you want to get sales by people recommending your product to others. Word of mouth is the most powerful marketing tool, and you want as many people as possible saying your brand name out loud. As all Amazon sellers know, keeping an eye on the changes in keyword search volumes is crucial. There are your primary keywords that you should be keeping an eye on in order to include them or exclude them from your listing and your PPC campaigns. At some point in time, you will look for your brand name and see an actual search volume for it. It is a truly wonderful experience for a new Amazon seller. It is an important milestone when your brand name gets added to the list of your indicator keywords. At this point you will realize that there are a number of people coming to Amazon every month looking for you. The challenge is that you must elevate your brand name from an irrelevant to a relevant keyword. Don’t break the rules and the guidelines – The rules and guidelines have been briefly mentioned above. Amazon gives its sellers plenty of space to be creative and to present their products. There is no reason for a seller to go outside of those borders in order to have a decent, well devised listing. Don’t put in false information – Do not put anything in your title that isn’t true about your product. This also includes anything that might confuse a customer and give them a different expectation of what they are going to get. Misinformation can lead to a lot of returns and bad reviews. Both of those can be a big problem for an Amazon seller since a low product rating and low seller score disqualify you from many Amazon programs. Things like lightning deals, promotions, and branded content will not be available to you. Not to mention having a harder time selling with a lower rating. Don’t repeat keywords – You might be under the impression that repeating a certain keyword in your title might get you a higher ranking. There is no reason to believe it to be true, also there plenty of room to repeat a keyword in the bulletins, product description and the backend. Even if it were true, it would be crossing a line of very poor taste. Don’t forget to use the right measurements system – If your product dimensions are a relevant feature, you must make sure you use the right units of measurements. If you are selling on Amazon.com, make sure you use the imperial measurements (gloms, inches, pounds ounces etc.) If you are selling in Europe or on Amazon.ca, make sure you use the metric system. It might be wise to always use both. You never know if someone will confuse inches for centimeters and ask for a return. this happens way more often than you might think. In conclusion, a good Amazon seller keeps a close eye on all the details. Writing your product title might have seemed like an easy and straightforward task, it turns out it’s a bit more complex. You can never look at your listings and think that you are done with them. You can always be doing something better. If you wish to be a successful Amazon seller you must always be thinking in those terms. Amazon is a massive market, there was nothing like before in human history. It is natural that it is always in flux and changes are a constant part of it. You must notice and anticipate those changes and adjust to the best of your abilities. Good Luck sellers!